There's a small, grassless public garden in a residential area just off Hama's Street 40, delineated by a modest metal fence and full of olive trees, their leafy branches laden with unripe fruit. There are also nine fresh graves, for locals whom residents say were killed during the Syrian security forces' recent bloody assault on this scarred rebel city. The dead were buried here, they say, because it was difficult to get the bodies to the cemetery, just a few kilometers away. The heavy shelling and tanks in the streets got in the way, the locals explain, and so this garden had to do. A brother and sister are buried here, side by side, with handwritten pieces of cardboard instead of tombstones. "The martyr Safwan Hassan al-Masry," reads one, where the 20-year-old man was laid to rest. The next heap of earth has a sign that reads, "The martyr Bayan Hassan al-Masry," for his 16-year-old sister. They died on Aug. 3, just a few days after troops stormed this city, which the Assad regime had encircled for about a month. "They were trying to escape the shelling," says a man who emerged from a nearby home and gave his name as Abu Abboud. The siblings were traveling by car, he says, and were shot at a checkpoint. Their bloodied bodies remained untouched in the vehicle for some four hours, until the spray of bullets whizzing through the air thinned enough to enable a few men to retrieve them. "There were many bodies in the streets," says another man, Abu Ibrahim, 26, as he reverently walks among the graves, most of which are covered with drying palm fronds and other branches. "We reached the ones we could reach, but the security forces took many bodies." "We used to sit here at night, smoke narghilehs [hookahs], drink tea, laugh and catch up on gossip," says one young man, standing in the garden. "Now this is a sacred place." There is one grave in this makeshift cemetery that is better maintained than most. Artificial red roses spring from its center, and the spot is surrounded by leafy potted plants, one placed in an old vegetable-oil tin. This is the final resting place of Milad Gomosh, a young man killed on July 31. His heartbroken mother tends to it every day. It's just across the road from her modest home. "God has fated us to be neighbors, my son," she says as she sits on the dry soil next to the plants. Milad's mother doesn't want her son's body moved to one of the city's official cemeteries. She wants him to stay close to her. This city of some 800,000 people is deeply familiar with trauma and mass graves. There are many reportedly scattered throughout the city, dating back to 1982, when former Syrian President Hafez Assad (father of the current leader, Bashar Assad) sent his military, including warplanes, into Hama to crush an Islamist insurgency. Perhaps 10,000 people were killed in that bloody period, although the exact figure is impossible to ascertain. Everyone you speak to, it seems, can rattle off a long list of relatives killed during that period. "My home was burned, I lost my brother, four cousins, all in all, 12 members of my family," says a woman who gave her name as Salwa. "My uncle and father," says a young man standing nearby. There are stone homes in Hama's historic quarter that have not been repaired since 1982. Rusted bullet casings still litter their floors of several homes. A dust-covered, moldy red military beret lies on the floor of one. "When we rose up, we knew what this regime can do," says Abu Warde, 26, a butcher. Residents say they knew where the bodies were unceremoniously dumped back in 1982  in the plot under the Meridien Hotel, under the streets of what is now a vegetable market in al-Hamidiyeh neighborhood, in places where residential buildings have since sprung up, in a garden near the Bakr al-Sadiq Mosque in al-Hamidiyeh. They didn't dare pray over them, they say, such was the regime's unrelenting hatred for its foes, even in death. The garden near the mosque is once again serving as a mass burial site, this time for 13 new victims of Hama's fierce defiance of a regime that will not tolerate dissent. 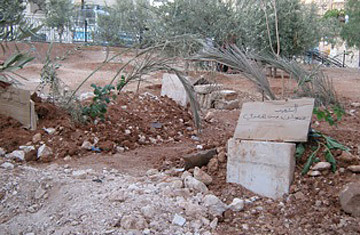 The simple graves, in two neat rows, sit in the shadow of the mosque. Some list names, others don't. "It's so that they don't harm the martyr's families," says Abdel-Halim, 40, who lives a few streets away, explaining the anonymity. "There are people buried here from 1982," he says. "I saw them." Abdel-Halim was just a young boy when he says he mischievously followed his father and brother-in-law to the mosque, where they intended to pray over and bury his sister's stillborn son. "I saw a lot of dead bodies. Most of them were men, and they were on top of each other," he says. "My father was so angry that I had followed him," he adds, staring at the ground and almost speaking to himself. "I got into so much trouble. He didn't want me to see that, to be scared. I can't forget that image. I can't ever forget that sight." After a few minutes of silence, he continues: "You know, these events now have taken me back 30 years. I remember 1982 very well. All seven of my uncles were killed." There are other gardens turned graveyards in this city. There's a vast field in Hama's Hay al-Kusor that looks more like a barren patch of land, with its dry tan-colored soil and scarce vegetation, than a garden, but that's what the residents of the multistory buildings along its perimeter call it. There are three graves there. "We buried them," says a beefy man, Abu Ali, while cradling his 20-month-old son Ahmed. He points to the graves as a crowd forms. "This is the martyr Yasser al-Nashar, he was about 20 years old. This is a woman from the Dayri family. And we don't know who this is. He was an old man. Why would they kill him?" "This is my brother's grave," says a voice from the crowd, pointing to the first mound of earth. Abdel-Hadi Nashar, 28, says his brother Yasser was only 21, the youngest of five boys. "He was shot in the heart by a sniper as he walked along the street. The bullet went right through him." "May he rest in peace," someone says. "So many young people died," offers another anonymous bystander. "The shelling was so heavy, we couldn't get him to the cemetery," Abdel-Hadi says. "And besides, if there was a funeral, they would have killed many more people at it. It was too dangerous." He pauses to offer a prayer over his brother's grave. "I just hope that what he wanted, what he died for, will happen," Abdel-Hadi says. "These are difficult days." See the 140 best Twitter feeds.